Bike rental in the Czech Republic, Slovakia, Hungary, Austria, Germany and Poland. Our project for cycling enthusiasts, Topbicycle includes a bike rental service for Central Europe. 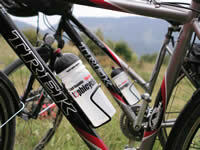 We offer quality hybrid bikes ideal for short bike trips as well as longer cycling holidays. This bike rental service covers the entire Czech Republic and parts of Slovakia, Hungary, Austria, Germany and Poland. We are currently the largest hybrid bike rental service in the Czech Republic. office of topbicycle is located. (See distance table and transport prices from Mikulov to centres of tourism in Central Europe). A staff member of Topbicycle’s Central Europe bike rental service will deliver the bicycles. Having expert, authorized knowledge in bicycle maintenance and care, they will check and tune up the bikes prior to delivery. Let us know where you will drop off the bike. Bikes can be returned without a transport fee in Mikulov. Otherwise we will charge the same for bike delivery (1 EUR per km from our office in Mikulov, Czech Republic). © 2008 by Greenways Travel Club, All rights reserved.